Σε πολύ καλή τοποθεσία της Γίεζου Άιλαντ, το Hotel Yeon είναι μια πολύ καλή βάση απ'όπου μπορείτε να εξερευνήσετε την σφύζουσα πόλη. Μόλις από το κέντρο της πόλης και μακριά από το αεροδρόμιο, αυτή η 2.5 αστέρων ιδιοκτησία προσελκύει πολλούς ταξιδιώτες κάθε χρόνο. Από τη βολική της τοποθεσία, η ιδιοκτησία προσφέρει εύκολη πρόσβαση σε κορυφαίους προορισμούς της πόλης. Με τις υψηλού επιπέδου υπηρεσίες και την μεγάλη ποικιλία ανέσεων, το Hotel Yeon δεσμεύεται ότι η διαμονή σας θα είναι όσο πιο άνετη γίνεται. Η ιδιοκτησία παρέχει δωρεάν WiFi σε όλα τα δωμάτια, ιδιωτικό τσεκ ιν/τσεκ άουτ, γρήγορο check-in/check-out, φύλαξη αποσκευών, ασύρματη σύνδεση Wi-Fi σε δημόσιους χώρους, φροντίζοντας για τη μέγιστη δυνατή άνεση των επισκεπτών. Επιπλέον, όλα τα δωμάτια διαθέτουν ποικιλία ανέσεων. Πολλά από αυτά παρέχουν ακόμη και δωρεάν καφές φίλτρου, πετσέτες, σύνδεση internet (ασύρματη), δωμάτια για μη καπνίζοντες, κλιματισμός προκειμένου να ευχαριστήσουν ακόμα και τον πιο απαιτητικό επισκέπτη. Εξάλλου, το ξενοδοχείο διοργανώνει πολλά ψυχαγωγικά δρώμενα έτσι ώστε να έχετε πολλά πράγματα να κάνετε κατά τη διαμονή σας. Το Hotel Yeon είναι μια έξυπνη επιλογή για τους ταξιδιώτες στη Γίεζου Άιλαντ προσφέροντας κάθε φορά μια ήρεμη και ήσυχη διαμονή. Hotel staff was very helpful and kind. Lots of help rendered. very close to waterfall, food, Ollie Market and lots of convenience stores. Hotel was easy to locate after taking bus 600 from hotel and a lighting at New Kyungnam Hotel, about 3 to 5mins walk!! Awesome stay!!! Thank you!! I was also touched by your kindness. I enjoyed the food you gave me. Thank you. Fuss-free hotel. Room is big and for the price paid, value for money. Limited parking lot space on-site, but they have an outdoor parking space about 10mins walk away from hotel, could get inconvenient during rainy days. Staff were very nice as well, but spoke minimum English. Hello. Hotel Yeon. Thank you for your good evaluation of the hotel. If you're mistaken, it's a minute's walk from the outside parking lot. Thank you. This hotel was in a great location- great view of the harbor (make sure you book a room with a view) and walking distance to a few bus stops, bars, cafes, food streets, trails, and waterfalls. It was a 20 minute bus ride to Hallasan National Park, or there are closer hikes you can do. The room and bathroom are a good size and there is a nice balcony where you can watch the sunset. The room was pretty clean but had scuff marks on the wall. No restaurant or anything fancy but you won't need one. I will stay here again! The minute we stepped into the room it was all wrong. The photos and few good reviews did not match the reality. We couldn’t bear the thought of staying here for 2 nights. The hair strands in the bathroom was the last sraw that pushed us to move to a 4 star hotel that was 25% cheaper than Yeon Hotel. It was a no brainer! 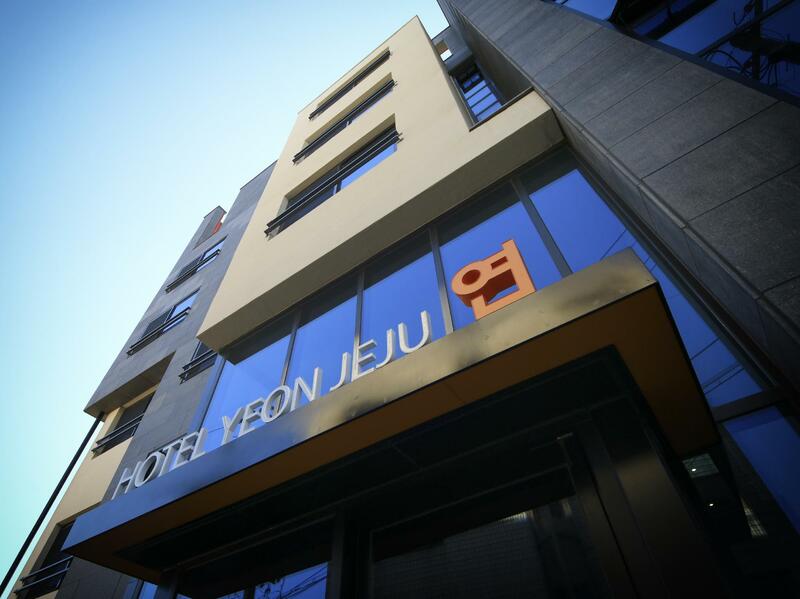 Hotel is in a great location if you are looking for somewhere in Seogwipo area. Location is great to several decent cafes, restaurants and mini marts. Great location. Limited parking lots. Staffs cannot speak or understand English well. Room was clean. Overall a pleasant stay. Pros: location and view from room( must chose ocean view) Cons: lack of pillow. The view from the room was magnificent. Clean room. Very friendly and helpful staff. Good location as it is accessible to public transport and nearby attractions. This was my second time staying at Hotel Yeon. It is in a great location and I would recommend booking a sea view room. The staff were friendly and the room is very clean. Thanks to the staff for accommodating my request for the ocean view. Fantastic. Great location. Short walk to the market and to the esplanade. The Staff are friendly, the room is spacious and, clean. We arrived early, and the staff was exceptionally friendly to my girl. Gave her snack and also always provided very clear direction: walked out to the street to show me the direction, did short internet research to provide me the bus route. The location is great. You can take a airport bus, and within 1.2 hrs you will be dropped off about 100-200m away from the hotel. You can walk to the major touristy falls, the art street, and easily take a bus/taxi to go to other places. The room is modestly equipped, but clean (it has a bathrope too!). The balcony was super clean and had a table and chairs to sit and enjoy morning coffee with beautiful view! However, it is indeed just a 2 star hotel. the bedding and linens are humble, no wall deco, just some stains and scratches. Also, it is surrounded by guest house and cheap hotels. These were all okay for us, but my girl was so miserable during the two nights we stayed here due to the mosquitos - she got 9 bites and i also got so much bites. i used their on-site bug sprays and their antirepellent device, but none of them worked. I managed to catch two of them on the last day morning, but it was too late. hahaha! Beside the hotel there a very nice restaurant call “수희식당 随喜餐厅” . Just near to the Sun Beach Hotel, +81-64-762-0777 really recommend.